Denver Photographer Neil Corman opens gallery nrc with a collection of images from around Denver. 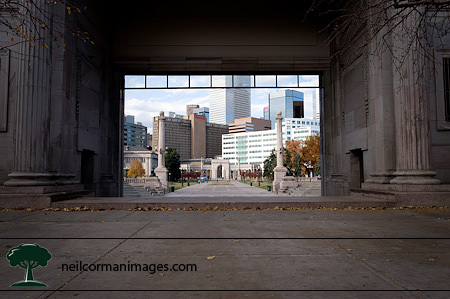 Civic Center Park sits on the edge of downtown Denver and divides the State Capitol from the City and County of Denver building. Walking past into the park, I noticed the natural frame provdied and how it acted as an entrance or gateway into the City of Denver. The natural black and white of the stone also provides a contrast between the old and new of Denver. In early January 2009 an overnight snow in Denver leaving a nice winter scene. Seeing the snow start to fall on Saturday evening, I planned to wake up early to get out to Washington Park prior to sunrise and see how it had been transformed. 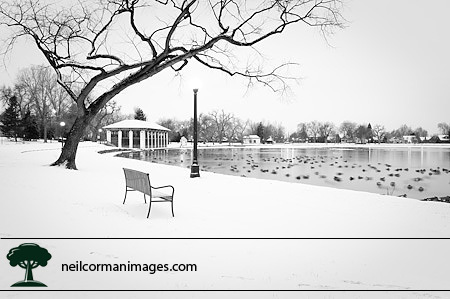 It was quiet in the park and as I headed to a tree which I found almost a year ago a slight chill was present but the beauty of the snow covered surroundings quickly made it go away. I photographed this tree once again from the original position and prior to heading elsewhere in the park I decided to try a different view of the tree from what I had photographed before. Alamo Placita Park is one of those parks which people have seen, but never have stopped more so as it is a small neighborhood park. Even the City and County of Denver website has limited information about the park itself. Walking around the park the image I wanted to walk away with was easily the tie in to Speer and the limited knowledge of the park. 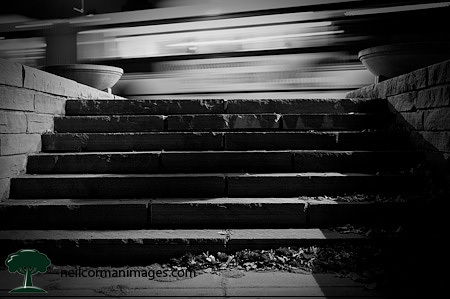 As it was near sunset I first thought about the lights of cars passing by the park, but seeing this set of stairs leading into the park this was a good place to start with the traffic taking the background as people rush by on their way. The Images of Denver Exhibition runs from March 6, 2009 – April 30, 2009 and includes over fifteen original images from around metro area.